This week has seen some interesting comments to the press by the Kurdish politician Mahmud Uthman on the progress of the discussion of the Kurdish demands, plus a meeting last night of the all-Shiite National Alliance. Both items put us in a better understanding to understand supply and demand mechanisms related to the auctioning-off of a country called Iraq, expected to take place over the coming weeks. 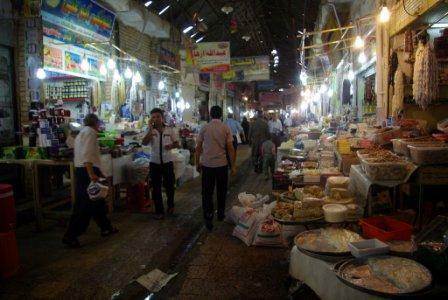 Venue: The souk in Arbil, the capital of the Kurdistan Regional Government. It is interesting that some limited reactions to all this Kurdish king-making business are beginning to materialise in the rest of Iraq, with some calling for the event to take place in Baghdad instead. However, most Iraqi politicians don’t seem to care. A preparatory meeting is scheduled for Sunday. Condition: Some wear and tear but still an incredible potential. Iraq is be auctioned off in pieces: Most buyers totally adore the piecemeal approach. The sellers have a lot in common but hate each other too much to establish a cartel; accordingly it’s a buyer’s market. Time: TBD, but interested buyers are expected to hang around all next week and probably longer. Main international participants: Iran, Turkey. The US delegation has been delayed due to the 2 November midterm elections but has expressed a strong interest; it is expected to show up some time next week. 20. The principle of balance should be adopted with regard to the issuing of postage stamps and coins, with due representation of all the components of the Iraqi people. 21. The foreign ministry should be abolished and be replaced by the Supreme Federal Commission of Foreign Policy, with sub-committees consisting of representatives of the regions and governorates affected by foreign policy questions. 22. The government is automatically considered resigned if the president of the Kurdistan Regional Government one morning wakes up and feels a preference for a change in government. In keeping with the principle of democracy and the inviolable basic tenets of Islam, this option applies to weekdays only. If the president wakes up with this feeling on a Friday or Saturday, he must either stay awake until the next weekday, or, if he elects to go to sleep again, must wait until the feeling resumes on a weekday. Whereas ISCI has specialised in customer satisfaction – “the customer is always right” – a problem relates to its real share of the market. At yesterday’s meeting of the National Alliance, both Fadila and Badr representatives were present, meaning that the rump of ISCI may be no more than 10 deputies. That means the potential combination of ISCI, Iraqiyya and the Kurds could be less than the 163 deputies needed to clinch a deal. 2. The National Alliance. According to Mahmud Uthman, the NA agrees to 18 out of 19 of the buyer’s conditions, excepting the Kurdish demand that the government be considered automatically resigned if the Kurds detect a violation of the constitution (this they do quite often). The main problem relates to trust. The NA politicians have said these things in the past and have failed to deliver. For that reason, the Kurds are still interested in maintaining links with a group of suppliers. It is noteworthy that Iran is interested as a “single buyer” for Iraq if NA is the supplier; if this does not work it would prefer something involving as much decentralisation and administrative weakness as possible. 3. Iraqiyya. So far, the only group to present certain limited objections to the buyer’s conditions. According to Uthman, these relate to the Kurdish demand that Baghdad finance the Peshmerga militia; article 140 on disputed territories and the Kurdish demands for keeping the presidency. The two first of these are eminently understandable, but the third is not. 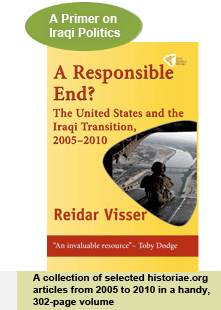 Iraqiyya is committing a major mistake by insisting on the presidency since it will be a powerless office until a change of its constitutional prerogatives has been confirmed by a referendum, by mid-2011 at the earliest. If the Kurds want it for symbolic power, Iraqiyya should give it to them and instead focus on real issues. One glaring lacuna, of course, is opposition by Iraqiyya to the draft oil and gas law, which in its current shape, if adopted, might signify the death of Iraq as a recognisable state entity. Still, they may of course opt to rely on parliamentary opposition to the bill, which will probably be massive once a debate on its contents gets going. The conundrum for the Kurdish buyers: Abd al-Mahdi/ISCI/Iraqiyya may be more prepared to stick to the letter of any deal, but there are problems relating to the ability to deliver (i.e. number of deputies in the parliament) and technical and logistical issues (the false premise of the legality of enhancing the powers of the presidency without a referendum, which is constitutionally impossible.) On the other hand, Maliki and the National Alliance may be in a better position to deliver, but to what extent they will provide the desired quality and live up to buyer expectations is a different matter. In the recent resurge of discussion of the planned 2010 census for Iraq, there has been much focus on the decision of the ministry of planning to scrap the “ethnicity” field from the questionnaire. This move has prompted strong Kurdish reactions since the Kurdish leaders see the results of such a census as relevant to the settlement of Kirkuk and other so-called “disputed territories” as per article 140 of the constitution. (Typical of the complex Iraqi situation, though the minister of planning is in fact himself a Kurd!) What has received less attention, however, is that the move by the ministry has been based on a ruling by the Iraqi federal supreme court that specifically tackles the relationship between the 2010 census and article 140. The answer from the court is interesting: It says the census law of 2008 falls within the ordinary decennial censuses that were held in Iraq in the previous century, ending with the 1997 census. The court specifically says that the upcoming census has no relationship whatsoever to article 140, and that article 140 calls for a separate count in the disputed territories. The December 2010 census, by way of contrast, is for all of Iraq. Based on this ruling from the court, the ministry of planning has apparently resolved to go ahead without the ethnicity field, since it has limited relevance for planning purposes, all Iraqis being equal in terms of government services etc. It is an interesting ruling that should perhaps serve as a warning to the Kurds about what sort of miracles the king they are currently in the process of making will be in a position to deliver at the end of the day. The Bid Round for the Next Iraqi Government: Why Don’t They Just Get On With It? In a small triumph for Iraqi democracy, the country’s federal supreme court today ruled that parliament had to end its “open session” and get on with the election of a proper speaker, “within 14 days” according to some reports, so that parliament could resume its supervisory functions in keeping with the principle of democratic separation of powers. The challenge had been mounted against the temporary speaker of parliament, Fuad Masum of the Kurdistan Alliance, by a non-governmental organisation. It is however unclear whether the ruling will actually prompt any fast response by Iraqi parliamentarians. It should be stressed that what the main factions are currently doing, i.e. postponing the election of a parliament speaker until the architecture of a more comprehensive deal including prime minister and president is ready, is not in line with the constitution. However, since all the big parties have major stakes in finishing a comprehensive deal, only small parties, like Tawafuq, have so far shown an interest in the idea of an early election of a speaker. But even when it comes to the bigger parties, it is really hard to understand why there should not be at least a premier nominee within a week or two. This is so because the current phase of the government-formation process, “the Kurdish drama”, is playing out in a slightly different way than expected after the surprisingly large anti-Maliki defections from the putative all-Shiite National Alliance left the Kurds with a kingmaker role they otherwise would not have had. Due to this development, the two competing formations of parties – i.e. the rump NA headed by Maliki, and Iraqiyya in a tactical alliance with ISCI and with Adil Abd al-Mahdi as premier candidate – have opted to take an uncritical approach to the Kurdish list of 19 demands, to the point where it seems clear that they are promising a lot more than they can ever deliver. Right now, the only potential problem seems to be that there could be some kind of draw whereby both Maliki and Allawi/Abd al-Mahdi promise to implement all of the 19 points! In that case personality and trust issues will necessarily come to the fore, and the Kurdish ranking seems to be 1. Abd al-Madhi; 2. Allawi; 3. Maliki; certainly as far a Masud Barzani is concerned. Still, Jalal Talabani, the Kurdish leader closest to Maliki, seems to be weakening the strong Kurdish position somewhat by his insistence on keeping the presidency for himself. Again, the idea that the 19 Kurdish points will ever be implemented seems totally unrealistic. This is why any premier nomination is likely to be followed by a period of confusion as the impossibility of implementing many of the Kurdish demands will necessarily dawn upon key players as soon as a premier has been nominated. In particular, once settled in his spacious new office, the new president will discover that he has no power and can get no power except through a special vote in parliament followed by a popular referendum. Even a conservative estimate would indicate May 2011 as a realistic timeline for a process involving a vote in parliament, a referendum law, the referendum itself and certification of the result. And that assumes a Yes vote to the required constitutional change. But again, as long as the fiction of the feasibility of implementing the Kurdish point remains, there is nothing that should prevent the Kurds from picking a winner within a week or so. One possible delaying factor could be the United States, which probably may still hold some leverage over the KRG president, Masud Barzani. It is conceivable that Washington is creating delays by either not answering the telephone due to the distractions of the 2 November midterm election, or by insisting on continued attempts to get all four major factions inside the next government, which means higher thresholds for finding agreement. At any rate, more meetings between the Kurds and the two competing formations of parties have been scheduled for this week; all in all there simply is no longer any excuse for not getting on with it. For the past couple of years an interesting energy revolt has been simmering in the mainly-Sunni governorate of Anbar: Local councillors are increasingly expressing a desire for a leading role for the local authorities in developing the Akkaz gas field. When the central government earlier this year included that field in a batch of contracts put up for auction to foreign companies, the local council protested and recently issued a threat about non-cooperation in case the deals went ahead. Today, the Akkaz field was awarded to a South Korean consortium after an auction in Baghdad. It will be interesting to see not only how the governorate politicians in Anbar react, but also how the Iraqiyya coalition – which is strongly represented locally in Anbar – responds at the national level. The constitutional facts of the matter are that the central government is supposed to be in the lead when it comes to “existing fields”, albeit in some kind of unspecified cooperation with the local authorities. Back in 2007, when an attempt was made to agree on an oil and gas law, Akkaz – which was discovered in the Saddam Hussein period before 2003 – was listed in the annexes to the draft law in category 3 of “non-producing” fields in need of considerable investment. Of course the oil and gas law was never adopted (and the Kurds protested strongly at the way the annexes were drawn up), and the central government has since gone ahead with the award (or attempted award) of several category 3 fields in previous licensing rounds with foreign companies, including Badra, Gharraf, Kifl and a gas field in Diyala. It is thought that the degree of “coordination” with the local authorities in these mostly Shiite-majority governorates (that is, except Diyala) has been quite minimal, and whereas protests from the local governorates themselves have been limited – and possibly have been ameliorated by the generous fees given to oil and gas-producing governorates in the 2010 budget – a general challenge to the government’s line has been mounted in the courts by Shadha al-Musawi, a former deputy of the old, all-Shiite United Iraqi Alliance, with respect to the contract signed with a British-Chinese consortium for the supergiant Rumaila field in the Basra area. Thus, the question is whether the oil ministry needs to do anything more in terms of coordination with the Anbar authorities than they have done in places like Dhi Qar. It is interesting that so far, the vision of a dominant central government in these issues has been promoted by Hussein al-Shahristani, a close ally of Prime Minister Nuri al-Maliki. Conversely, the Kurds and forces close to another Shiite party, the Islamic Supreme Council of Iraq (ISCI) have been accused of abetting regionalist tendencies in Anbar, which used to have a nationalist orientation. Given the current rivalry between Maliki and Ayad Allawi to win over the Kurds in order to form the next government, it would be interesting to see where Allawi’s Iraqiyya really stands on this important issue concerning the key question of whether Iraq should be centralised or decentralised. If Iraqiyya supports the Akkaz revolt against Shahristani, maybe it should stop calling itself Iraqiyya altogether and instead merge with the Kurds and ISCI to form a new parliamentary bloc called Al-Kurdistaniyya? It is noteworthy in this context that the ministry of planning, headed by Ali Baban who is considered quite close to Maliki, recently announced its decision to scrap the question about ethnicity in the forthcoming census – a move likely to meet with Kurdish protests and applause from the Sunni Arabs in northern Iraq. At Versailles, in 1919, in reaction to the 14 points outlined by US President Woodrow Wilson as a basis for the peace settlement after the First World War, Georges Clemenceau, the French premier, famously complained, “Even God was satisfied with Ten Commandments, but Wilson insists on fourteen”…. Today, the Kurdish leadership aims even higher, with “19 points” intended as its basis for negotiations to form the next Iraqi government. Recently, the Kurds have seen a strengthening of the fortunes, first after the failure of Iraqiyya and State of Law to talk to each other, and then a result of the partial disintegration of the projected all-Shiite National Alliance, leading to a situation in which both the Allawi and Maliki camps are seeking Kurdish support instead of choosing the more logical option of making an alliance together. As a consequence, we have the ironic situation whereby two declared Iraqi nationalists who are theoretically committed to working against the destruction of the Iraqi state in practice are trying to outbid each other in an attempt at satisfying Kurdish aims that are directed precisely at the dismemberment of Iraq as a recognisable and governable state. The other day, Aliya Nusayf of Iraqiyya declared that “the Kurdish demands will only be implemented through Iraqiyya”! What a pathetic thing to say for a representative of a party that was once critical about the constitution adopted in 2005, not least for its excessive concessions to the centrifugal forces in Iraqi society. True, Nusayf is not on the accredited list of official spokespersons of Iraqiyya, but why is she allowed to say such things with impunity? Maliki’s State of Law aren’t lagging much behind either, with Khalid al-Asadi recently declaring himself in favour of most of the 19 points with the possible exception of the rather ridiculous idea that the government automatically be considered resigned if the Kurds withdraw from it. However, whatever one thinks of the politics of centralism versus decentralisation, in contrast to God and statesmen seeking to redefine the rules of the international community in 1919, the Kurds need to take into account certain guidelines that they themselves often claim to adhere to: the Iraqi constitution adopted in 2005. The problem is that some of the Kurdish demands cannot be implemented without abrogating the Iraqi constitution altogether. Some of the Kurdish demands are boilerplate items that should not pose a problem, or are loose enough to be interpreted in whatever way one wishes. For example, when the Kurds are calling for “balance” in the state apparatus, they really mean that everywhere there should be a percentage of officials corresponding to the Kurdish share of the total population. In other words, they mean that professionalism as a principle should be set aside to make room for appointees vetted by the two biggest Kurdish parties. This sounds like a bad idea, but it is not something that could be done overnight and presumably there would be a degree of judicious bureaucratic resistance. The first major problem in the Kurdish demands, from the legal point of view, is number four, the establishment of a senate within the first year of the parliament, and the extension of the veto powers of the presidency council until the senate is up and running. This is simply one hundred per cent unconstitutional and against the basic principles of separation of power. It is for the Iraqi parliament, not the government, to draw up the rules of the next senate, with a two-thirds majority. An attempt has been made at this through the work of the constitutional revision committee, but after 3 years of work (well, “existence” would be more correct) this committee has only produced a partial report. Although it does outline the provisions for a senate, it has left many other questions unanswered and cannot be voted on in its present shape. Even more importantly, the current powers of the presidency council automatically expire as soon as a new president is elected. The presidency council was a transitional arrangement for 2005-2010 only (as per article 138) and therefore it was also given strong powers; by way of contrast the next Iraqi president will have no real power, as defined in article 73 of the constitution. To change this, one would need to change the constitution which can only be done in one of two ways: Either with a special two-thirds majority in parliament followed by a referendum (article 126), or as part of the broader constitutional revision with an absolute majority in parliament and a referendum in which any three governorates can vote the changes down by a two-thirds majority in their constituencies (article 142). Again, it is not possible to seat a government based on eventualities relating to parliamentary dynamics and forthcoming referendums. What if the proposal to expand the powers of the presidency council is rejected by the people? Similar problems apply to the tenth Kurdish demand, acceptance (by parliament!) of the latest oil and gas draft law (of 2007) “and its acceptance means recognition of the oil industry activities going on in Kurdistan and gives Kurdistan the rights to explore and export” (sic!) Again, the government cannot do anything other than introducing the oil law to parliament, which it failed to do last time due to Shiite-Kurdish disagreement. Whether the parliament agrees or not is a different issue altogether. It is worth noting that the current draft oil and gas law appears to be unconstitutional in many ways, for example by treating producing governorates and regions on a different basis, apparently giving contracting rights to regions only (and not governorates). 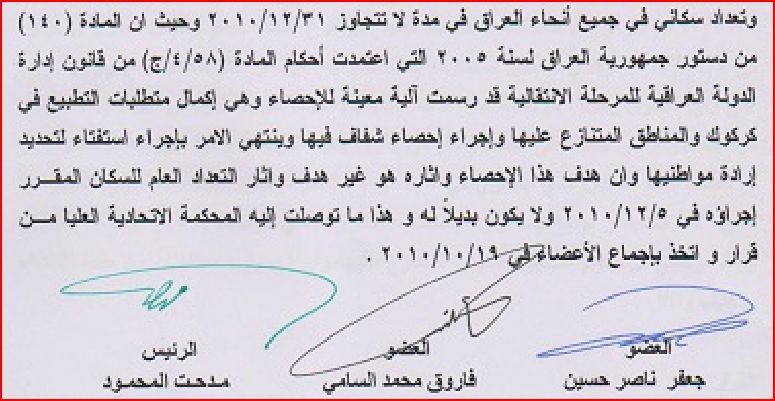 If a right to anyone outside Baghdad to sign contracts is indeed recognised by the Iraqi parliament – and that is a big if, since it would seem to violate article 112 which stipulates shared power in strategic energy policy – then it should apply to regions and governorates alike, otherwise it would be against article 115 of the constitution that puts regions and governorates on an equal footing in terms of residual powers. Of course, the Iraqi parliament would think twice before giving contracting rights to Basra, Maysan and Dhi Qar. Similarly, no Iraqi government can promise to “implement” the parts of article 140 that relate to referendums on disputed territories, since special legislation on those referendums would have to be passed by the Iraqi parliament. The Kurdish leaders may not care much about the principle of separation of powers in their own constituencies, but in the rest of Iraq it still applies, or so one hopes. One may agree or disagree with the Iraqi constitution of 2005, but in areas where it is clear it should be respected – if not, one might as well abandon all the nice talk about democracy altogether, and instead stage a military coup proper. The Kurdish negotiating document is not only a step towards the complete destruction of the Iraqi state, it is also a flagrant violation of the constitution that the Kurds themselves supported back in 2005. Today, there are apparently three races going on in the struggle to form the next Iraqi government. Firstly, there is the Maliki project. This is based on his recent success – apparently with a little help from Iran and the Sadrists – in strong-arming parts of the Iraqi National Alliance (INA) to accept him as the premier candidate for an all-Shiite National Alliance (NA) that also has the backing of Maliki’s own list State of Law (SLA). Quantifying the exact level of support for Maliki among non-Sadrist INA deputies is an inexact science, but it is thought that he has got at least the 89 SLA deputies, the 40 Sadrists plus Ibrahim al-Jaafari and Ahmad Chalabi on his side – which would bring the total number to a minimum of 131. On top of this, Maliki is obvious angling for the support of the Kurdish parties (58), which would easily bring him above the magical 163 mark required to have a majority in parliament. Additionally, it seems clear that Maliki is also hoping to lure a new coalition between Unity of Iraq and Tawafuq into his coalition (10 deputies altogether with promises of more), in order to serve a symbolic “Sunni representation”. Importantly, even though Maliki is clearly trying to satisfy the Kurds when it comes to their long list of demands for supporting a government, he is not particularly positive to the idea of making constitutional changes (such as limiting the powers of the premier) as a basis for government formation. Still, it is noteworthy that the project involves two “regional” kingmakers: The Sadrists with Iranian support, and the Kurds and perhaps especially Jalal Talabani, again with an apparent nod from Iran. Second there is the Allawi project. This appears to consist of a competing path to hit the 163 mark: First building a coalition between Iraqiyya and as many INA breakaway elements from the NA as possible plus Tawafuq and Unity of Iraq; then convincing the Kurds that this kind of coalition would be favourable compared to a deal with Maliki. Again there is the problem of estimating exactly how many NA deputies can be trusted to join: ISCI including Badr account for around 18 deputies (19 with “Hizbollah in Iraq” which is also part of this family), Fadila have six, and one Shaykhi deputy from Basra is reportedly leaning in this direction too. That would add up to around 26 on top of the 91 Iraqiyya deputies, thus 117 and still some way to go to catch up with Maliki, and there is the added insecurity about what the Badr representatives (and “Hizbollah in Iraq”) would ultimately do if it came to a vote: All of the ISCI-affiliated parties were traditionally close to Iran, and whilst the current level of protest against what appears to be increasing Iranian support for Maliki is unprecedented, many commentators still believe that ultimately some of these elements will fall back into the NA fold. The latest twist relating to this project is the apparent willingness of Ayyad Allawi to let Adel Abd al-Mahdi of INA/ISCI be the premier candidate in a move that could perhaps make this kind of alternative more attractive to the Kurds, and might also serve to compensate for the inability of Iraqiyya to meet Kurdish demands on oil and Kirkuk (which would bring them into trouble with their own electorate). Still, one should probably not discount entirely the idea of a more straightforward Iraqiyya-led government under Ayad Allawi as at least a theoretical possibility. It is interesting, too, that if carried out the reported threat by the Kurdish Goran list to withdraw from the Kurdish coalition in protest against the electoral law for the Kurdistan provincial elections next year would create yet another medium-sized bloc in parliament potentially open for grabs for would-be premier candidates. It is important to note that both these projects are competitive. Each of them pays lip service to the idea of all wining blocs eventually joining, but it seems perfectly clear that in reality the Maliki alternative will marginalise Iraqiyya and the Allawi alternative will marginalise State of Law: The “invitation” to their main opponent to join is mostly tongue in cheek. By way of contrast, the Americans still seem to be hoping that all the original four big winning blocs – Iraqiyya, SLA, INA and the Kurds – will somehow eventually get together in a single coalition to form the next government, preferrably without the Sadrists in a too-dominant role. In this third approach to government formation, the Americans are actually raising the threshold in more than one way. Firstly, a four-way agreement is logically speaking more difficult to achieve than a three-way one. Secondly, and this has perhaps not received the attention it deserves, almost all American proposals on the subject of government formation seems to involve simultaneous measures of constitutional reform, since redefining the powers of the presidency now appears to be an aim after the initial failure to resuscitate the dormant Iraqi national security council as a way of appeasing Iraqiyya. Constitutional reform, in turn, can be achieved in one of two ways in Iraq: Either under the transitional article 142 of the constitution, according to which a single batch of changes can be approved by an absolute majority of parliament (163) but then would need popular approval in a popular referendum where a two-thirds majority against the changes in any three governorates can torpedo the whole project. Alternatively the changes can be passed with a two-thirds majority in parliament (216), to be confirmed in a general referendum, this time with no special-majority requirements. The more general point is this: Any government-formation involving constitutional reform is risky and potentially time-consuming business. If the route to constitutional reform under article 142 is chosen one needs to remember that the Iraqis have been working on this package of reforms since 2007 without being able to agree on it. The other alternative, however, involves a special majority in parliament of 216. The question then is, even if Washington should succeed in pushing for a move that would strengthen the presidency to such an extent that it becomes attractive to Iraqiyya, is it not likely that Iran would seek to introduce counter-measures if it felt threatened? It would then need only 109 deputies on its side to derail the whole project and everything would be back to square one. Have we already forgotten what happened in Iraq in February and March this year, when almost the entire Iraqi system succumbed to the pressures from Iran and Ali al-Lami, the great de-Baathification leader? And then of course, there would be the long wait for confirmation in a referendum and the concomitant risk involved for the party that is banking on an empowered presidency: What if the referendum disapproves of the changes and the presidency remains in its current form, with symbolic powers only? Clearly, it would be unconstitutional and therefore quite impossible to “upgrade” the presidency before any such a move had been approved by the population in a general referendum. Earlier this week, an international court of litigation in London ruled that the former US diplomat Peter Galbraith should receive compensation from the Norwegian oil company DNO in the region of some 35 million US dollars for lost profits from Galbraith’s involvement in DNO’s Kurdistan investments. Galbraith and another claimant, the Yemeni millionaire Shahir Abd al-Haqq (who will receive the same amount from DNO), were squeezed out of the deal between DNO and the Kurdistan Regional Government (KRG) when the latter renegotiated the production sharing contract for the Tawke oilfield in 2008. The Norwegian business daily Dagens Næringliv (DN) has been in the lead in investigating Galbraith’s role in Kurdistan and yesterday for the first time published comments on the affair by the Norwegian diplomat Kai Eide, with whom Galbraith fell out due to differing views on the conduct of the Afghanistan elections in 2009. At the time, Galbraith supporters conjured up a conspiracy theory to the effect that the revelations were part of a Norwegian plot against him motivated by the Galbraith–Eide spat in Afghanistan – a somewhat far-fetched proposition which in any rate would not have changed the facts of the case, which relate to actions by Galbraith in Kurdistan in the 2004–2008 period, long before Eide had anything to do with Afghanistan. Nonetheless, until now, Eide has been reluctant to comment publicly on the Tawke-gate affair. In yesterday’s interview, Eide for the first time provides his own take on Galbraith’s involvement. Perhaps most importantly, Eide suggests Galbraith should give the award money to children in need in Kurdistan. Additionally, he also goes quite far in suggesting a main issue between himself and Galbraith at the time when they both served in Afghanistan was Galbraith’s alleged preference for bending or even ignoring Afghan rules and regulations that were in place at the time. In Iraq, of course, it was different, since Galbraith played an not inconsiderable role in framing the rules himself. Nonetheless, even the highly decentralist Iraqi constitution of 2005 makes it clear that the oil and gas of the country belongs to the entire people, in all regions and governorates. Accordingly, whilst Eide’s proposal is constructive, it would be more in the spirit of the constitution if Galbraith gave the money to needy children in all of Iraq, and not only to those living in the KRG areas. But he is probably not going to do that, is he? Galbraith’s latest passion appears to be alternative energy, reportedly a main plank of his strategy to win a seat in the Vermont senate in November. In early comments on the award, he promises to use the money to invest in alternative energy “in Vermont and Kurdistan”. And presumably he may think he can do so freely without consulting Baghdad, since controlling the wind and the sun is not listed among the exclusive prerogatives of the central government in the constitution! On a more serious note, though, the Tawke award should be of obvious relevance to the ongoing negotiations between Maliki and his National Alliance and the Kurds. The Kurdistan oil deals are controversial precisely because so much of the profit is expected to leave Iraq altogether to the benefit of foreign investors (remember, Galbraith was just “Mr. Five Percent” and still was awarded some 35 million USD). In fact, some of the few Iraqi politicians that have dared protest Galbraith’s simultaneous triple role – investor in Kurdish oil, author of key Iraqi constitutional provisions on energy management and adviser to the US Senate on American policy in Iraq – come from Maliki’s own party. Abd al-Hadi al-Hassani and Hussein al-Shahristani have opposed both the Tawke deal specifically and Kurdish attempts to circumvent the central government more generally. The latest development here is a claim by the Kurdish politician Ali Hassan Belo to the effect that the Kurds can export gas from the region freely to Europe, and that interference by Baghdad would be unconstitutional! The claim by Belo is wild, since the constitution at least provides for a shared role between Baghdad and the provincial authorities in devising a strategic policy for the country’s energy resources: If starting gas exports to the EU is not “strategic” then nothing is. Nonetheless, the statement (and indeed the whole Galbraith/Tawke-gate affair) is probably a bellwether of high Kurdish expectations for the forthcoming government negotiations and as such indicates the uphill struggle that Maliki faces if he wants to secure the premiership and pay attention to his electorate at the same time. But subsequently, as the situation in Iraq evolved, the company was forced to renegotiate its contact. Galbraith and another third party – a Yemeni company – were cut out, apparently because Kurdish officials knew that the central government in Baghdad would not approve of their involvement. It is also interesting that the Kurds apparently thought of submitting the contract for review back then and likely deemed Galbraith’s name a potential eyesore. Let the Kurdish Drama Begin! It is a pitiful sight: The two would-be saviours of the Iraqi nation, Ayad Allawi and Nuri al-Maliki, trying to outbid each other in an attempt at satisfying the author of one of the most destructive and separatist agendas for Iraq’s political future, the Kurdish leader Masud Barzani. All because Allawi and Maliki cannot trust or even talk to each other. But that is where we finally are, some seven months on from the 7 March elections. The nomination dynamics within the recently-reconstituted all-Shiite National Alliance (NA) played out in way that suited the Kurds more perfectly than they could have ever dreamt of: The size of the internal protest against Maliki – in the range of 10-20 NA deputies – was just big enough to make him totally reliant on the Kurds, instead of having the theoretical alternative of building ties to smaller parties like Tawafuq, Unity of Iraq and the independent minority representatives. It was also big enough to keep the scenario of an alternative Allawi-led government afloat, at least in a theoretical sense, thus finally turning the Kurds into real kingmakers. So there we are. Maysun al-Damluji of Iraqiyya yesterday said “Iraqiyya looks positively on the Kurdish list of demands”. As for Maliki’s approach, Muhammad Khalil of the Kurdish alliance said his initial response consisted of “positive signs”. Let’s not forget what the Kurdish list of demands is: It consists of 19 points aimed at finishing the project of emasculating Baghdad that was begun with the constitution adopted in 2005 (whose co-architect, Peter Galbraith, was today awarded compensation estimated in the range of 55 to 75 million US dollars from the Norwegian oil company DNO for lost business stakes in Kurdistan dating from 2004-2008 when he was also a consultant for the Kurds on constitutional issues). According to the Kurdish perspective, the constitution did not go quite far enough, so they included new ideas about decentralising the oil sector, settling territorial disputes within a new timeline and prolonging veto powers based on ethno-sectarian formulas of power sharing. Additionally, there are some new demands more reminiscent of a kindergarten logic than modern democracy, including the idea that “the government is considered resigned if the Kurds withdraw because they consider it to be in violation of the constitution.” So much for the principles of separation of power and parliamentarism! Ironically, the Kurds already seem to be in violation of a pledge reportedly made during the visit by Masud Barzani to Washington last January to refrain from raising controversial issues like Kirkuk as a basis for participating in the next government; no prize though for guessing Washington’s “reaction”, which so far has consisted of encouraging Maliki and the Kurds to talk more and get on with forming a government anyway. The reason we finally got here is fairly simple. Since last autumn, due to its dislike of Maliki as a person, Iraqiyya has been wasting its time talking to the Islamic Supreme Council of Iraq (ISCI) and the Iraqi National Alliance (INA) more broadly, hoping to lure this half of the then still putative all-Shiite NA away from Maliki (possibly through the medium of the Sadrists). For his part, Maliki has been cultivating ties with the Kurds and to some extent Tawafuq. In isolation, none of these strategies provided numbers that sufficiently added up towards the magical 163 majority mark; the change came through the sudden change of heart by the Sadrists, who until recently were loud critics of Maliki. With a little help from Iran, though, axes were buried and Sadr began supporting Maliki’s nomination within the NA. And voila, on a more realistic basis this time, Maliki could resume his dialogue with the Kurds which has after all been in the making for more than a year. So the question is whether Maliki can satisfy the Kurds, who felt short-changed during the previous government, and this time are demanding firmer guarantees. He will probably have problems given the considerable but often under-estimated opposition to Kurds from within his own ranks, where there are those who think of both oil and Kirkuk in centralistic terms and are generally quite critical of the Kurds: Media close to the Daawa published slander about the private jets of the Barzani family only days ago. The recently-announced government decision to postpone the planned census a couple of months – against the wishes of the Kurds – is another indication of the limited room for manoeuvre available for Maliki. But the point is that neither Maliki nor Allawi seems able to do anything else at the moment – and the Iraqi electorate seems incapable of articulating the level of disgust that this ironic twist of events so clearly warrants. So maybe we should all lean back and watch the Kurdish drama unfold for some time? Gradually the dust is beginning to settle after Friday’s somewhat abrupt nomination by the all-Shiite, theoretically 159-man National Alliance (NA) of Nuri al-Maliki as premier candidate for the next government. For months there had been discussion of consensus procedures, with intricate formulas involving 80% and then 65% agreement in a committee of so-called “wise men”. In the end, Maliki was simply adopted by acclamation by the parties that were present at the final meeting – basically the three Daawa factions (including Jaafari), the Sadrists, the Iraqi National Congress (Ahmad Chalabi), and Hadi al-Ameri of the Badr brigades. The only NA factions that had no representatives present were the Islamic Supreme Council of Iraq (ISCI) and Fadila. The exact position of ISCI/Badr (18 seats) remains unclear: ISCI is still publicly negative to Maliki, but some in Badr are showing a willingness to preserve the NA at any cost. Similar tendencies apply to Fadila (6 seats), which however today announced that it remains part of NA. The Kurds are obviously signalling great interest in developments: Due to the defections from NA they are now needed to form the government and thus finally achieve the kingmaker position they have been seeking from the start but which was always going to be secondary to the triangular struggle between the two Shiite blocs and Iraqiyya. Positive noises have also come from some in Tawafuq, whereas Unity of Iraq – which was once closer to Maliki – recently said they preferred his defeated rival, Adel Abd al-Mahdi of ISCI. Most interesting, of course, is the reaction of Iraqiyya, which lately has promised to never take part in a government led by Nuri al-Maliki. The first element of their response strategy is positive: It consists of building an parliamentary alternative to State of Law by reaching out to ISCI, Fadila, Unity of Iraq and possibly Tawafuq. Few other things than hatred of Maliki bring these groups together, but this kind of alliance would at least signify some kind of Iraqi reaction against developments where Iranian pressure on the Sadrists to accept Maliki as their new PM favourite seems to have been a key factor – and in the case of ISCI would also mean some kind of definitive Iraqization after a long period of close coordination with Iran. Together, these parties might be able to convince the Kurds that there could be advantages in keeping Iran at an arm’s length in the coming period, although the Kurds are probably equally interested in concessions related to more local demands concerning Kirkuk and oil. The other aspect of the Iraqiyya reaction, unfortunately, is amateurish and childish in the extreme. It involves a challenge to the legality of the new incarnation of the National Alliance based on the withdrawal of ISCI and Fadila after the first meeting of parliament! واعتبر المتحدث باسم العراقية حيدر الملا مساء الجمعة أن “موضوع الكتلة النيابية الأكبر (في إشارة إلى كتلة التحالف الوطني) قد انتهى بانسحاب المجلس الأعلى وحزب الفضيلة . What this does is essentially two things: Firstly, with it, Iraqiyya implicitly agrees with the concept of post-election bloc formation to which it has objected so strenuously ever since the federal supreme court explicitly enabled it when the results of the 7 March elections were announced. Secondly, Iraqiyya is making up the rules. The truth is, there are no laws governing kutla (bloc) formation and kutla secession which can take place whenever and wherever the parties themselves want: In this matter, it is the president that designates the nominee of the “biggest bloc” that will effectively serve as the constitutional court. It is pretty obvious that parties may be allowed to secede from NA just in the same ways that they seceded from Tawafuq in the previous parliament (and in the same way that Fadila and ISCI might join Iraqiyya if they so desired). Just like in the case of the videotapes of early constitutional committee meetings, Iraqiyya is wasting its time and pursuing a dead end in this case; it would probably gain more from the other, bloc-building strategy. But as ever, the most hopeless reaction is from the Obama administration. Even after Maliki’s candidature had been announced, it managed to reiterate a desire for all four blocs coming together in a single government – but at the same time indicated concern about having the Sadrists in a kingmaker role! When will Washington realise that as long as the premier comes from the entity called NA, it is impossible to not have the Sadrists in a kingmaker role? The main cleavage inside the NA is between Maliki and Hakim (and not between Maliki/Hakim and the Sadrists, as per the USG utopia) so whoever wants to emerge victorious within the NA setting will need the support of the Sadrists, period. Only the alternatives of Iraqiyya and State of Law forming a government of their own (now increasingly unlikely) or the new alternative of Iraqiyya joining in a bloc with NA defectors, Unity of Iraq and Tawafuq (if the Kurds agree) would constitute true alternatives to NA and the concomitant Sadrist kingmaker role. The next important question is whether the Kurds agree to start a parliamentary process of selecting the president, speaker and PM candidate right away or whether they prefer to embark on comprehensive negotiations with Maliki (and any competing bloc) prior to the resumption of the parliamentary process.